You have 3947 characters. Don’t forget to add important and relevant keywords in your description to improve your iTunes app page and optimize your SEO. Listen to martial arts the most Jin Yong. Jin Yong official authorized, Jin Yong Chinese martial arts fiction book full of shocked listing! 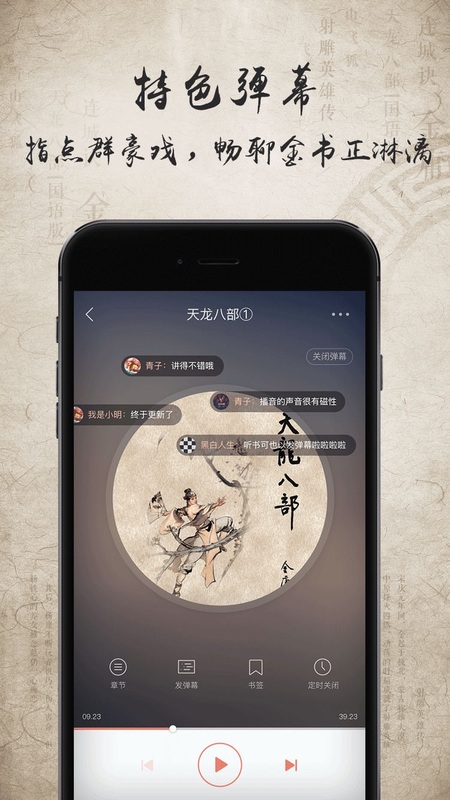 The sound of the way hundred percent reduction to restore the original, not the same listening and reading experience, more radio version, Cantonese and other dialect version of the serial update; membership subscription, package offers, free live, barrage comments and other functions continue to enrich. Swordsman feast of martial arts, chivalrous tenderness of the sound of rivers and lakes, do in the "Jin Yong listen to the book!" ‣ Professor Yan Yan of Peking University: "Jin Yong 's martial arts novels contain fascinating cultural atmosphere, rich historical knowledge and profound national spirit, and deal with the relations among different nationalities with equal and open attitude. ‣ Sun Jiazheng, Chairman of the China Federation of Literary and Art Circles: "Jin Yong has spread the spirit of Chinese culture of integrity, kindness, and humility throughout the world. "Yang Yongan, Vice President of the Hong Kong Society of Novels and President of the Hong Kong Institute of Chinese Language and Culture, said:" Jin Yong 's novels have profound influence on the Chinese community, and the novels are elegant and concise, powerful and full of literary elements and artistic values. "Song Yong - fang, Assistant Director of Curriculum Planning and Development Department of the Ministry of Education of Singapore, said:" Jin Yong 's novels are strong in literature and chivalrous in spirit, and the content is popular and students will generally understand and like it. ‣ live reading: Jin Yong martial arts full play, authentic martial arts world of sound, reading the new experience. ‣ open words: more than one interactive comment community, hot Comments martial arts master Qi participation, arena is not lonely. 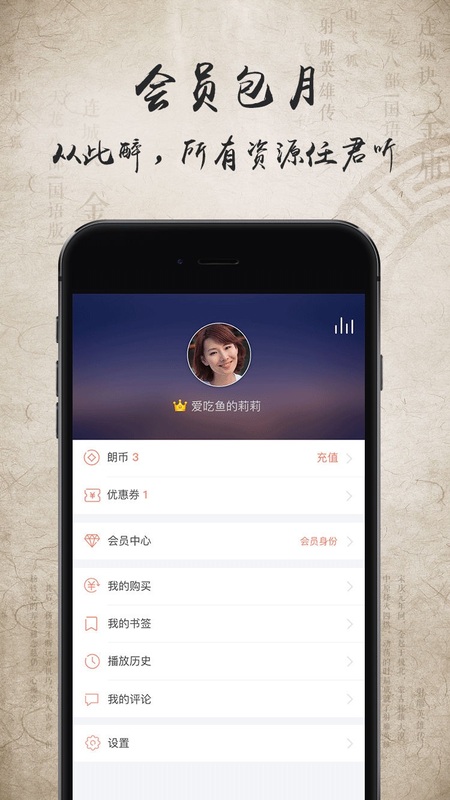 ‣ enjoy sharing: nice to share, microblogging, WeChat, circle of friends, QQ, everyone can not be less. ‣ value-added services: chapter back to brief tips, plot master painting, listen to see audio reading is not monotonous. ‣ intimate function: free audition, single set of exchange downloads, audio bookmarks, background play, timing off. ‣ Introducing Subscription Membership. With "monthly auto renew subscription membership", members can listen to all the books. ‣ Price: 19.99 USD/month. 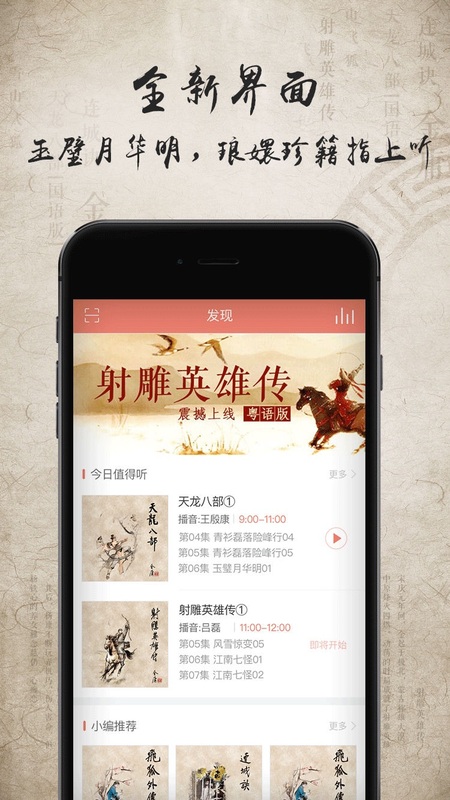 With automatic monthly subscription through the In-App Purchase, members will enjoy the most convenient way to listen to Jin Yong's audio books. ‣ Automatic subscription can be cancelled at any time. After the cancellation, the cost has been paid will not be refund. While the membership will remain to the member expiration date, and no more consequent charge. With the authorization of Mr. Jin Yong, Guangzhou Lansheng Books Co., Ltd. enjoys the exclusive right to use the Chinese version of "Jin Yong Works" (including the right of information network communication and broadcasting right). Guangzhou Langsheng Digital Media Technology Co., Ltd. is authorized by Guangzhou Langsheng Books Co., Ltd. to develop the related application program "Jin Yong Ting Shu Shu" and its global distribution and promotion. It is hereby declared that any unauthorized production or distribution may be subject to legal liability.